Mini golf is among the very best family-oriented warm weather activities. And with exciting themes like pirates and the Wild West, your little ones will love every moment of it. If you’re looking for fun plans for the evening, we highly recommend checking out one of the best mini golf courses in Idaho! Putters Mini Golf in Twin Falls, Idaho is known for their wonderful mini golf as well as their Hawaiian shaved ice. Rates are quite affordable with two-years-old and under getting in free and an average of $7 for others. They offer birthday specials and military discounts. Mardia Katz in Meridian’s main goal is for visitors to “experience the party and fun atmosphere—Mardi Gras style.” They offer one-round and unlimited mini golf passes. This in-doors course is perfect for a rainy day. Wahooz Fun Zone is the recipient of the 2017 Certificate of Excellence. The park includes mini-golf, a water park, bowling, bumper carts, rides and more. The 18-hole miniature golf course is Wild West themed with one round costing only $8. One recent reviewer of the Puttin’ Around Mini Golf Course in Post Falls, Idaho said, “there was lots of greenery and it was well-maintained.” The common thread among all the reviews? Puttin’ Around puts up a fun atmosphere with friendly staff and delicious root beer floats. The 7N Ranch Resort “offers year-round activities and easy access to outstanding fishing, hiking and wildlife viewing, boating, cross-country biking,” and miniature park. The Old Farm Mini-Golf sits on a picturesque course with 18 beautiful holes. Seven-year-olds and under get in for only $3 while old-timer eight-year-olds cost $6. The Airway Hills Golf Center is the perfect spot for veteran and brand-new golfers to practice their game. According to their website, Airway Hills “features the region’s only deluxe outdoor miniature golf course.” What’s that mean? A course that better fits in and uses the surrounding natural features to enhance the experience. Play a round of 18 or look at unlimited and family package plans. Triple Play Family Fun Park is comprised of three sections: the family fun park, the indoor water park, and the attached resort hotel and suite. While each of the sections provides a great excuse to spend a weekend away with the family, the award-winning family fun park stands out. 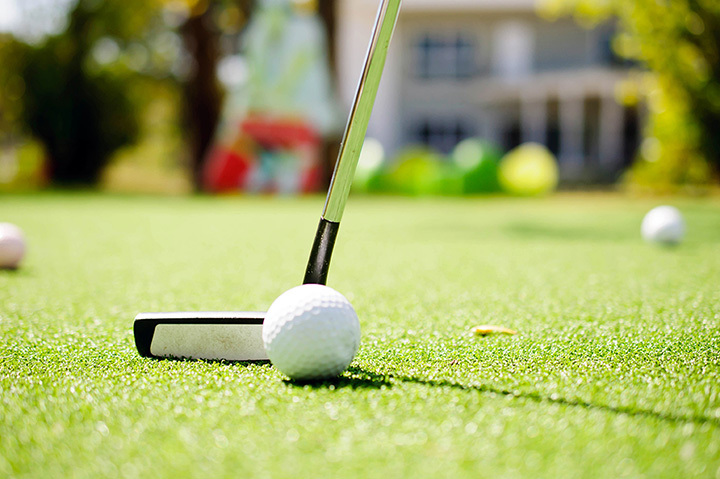 Mini-golf junkies will love their two on-sight courses, a nine-hole inside course and an 18-hole outside course. According to the Craze Zone’s website, it’s “the craziest fun place in Southeastern Idaho… complete with a large Lazer Tag arena, Black-light miniature golf course, Crazy Kiddy Jungle,” and more. The golf course, called Galleria golf, is a nine-hole indoor course with extremely reasonable prices: only $3.50 for the first game and $1.50 per game after that. Squealers Fun Park in Rigby, ID is another fantastic amusement park. Come for the raceway, ice skating, or mini-golf and you’ll leave with at least a few great memories. They’re open until 10 p.m. every night. Sign up on their website for coupons and discounts.